Injuries are a key factor in any game, and this game is no different. Nebraska will miss the presence of tackle Baker Steinkuhler on the interior of the defensive line. The Huskers need Chase Rome—among others—to step up with Steinkuhler out. And center Justin Jackson is out. It will be Mark Pelini or Cole Pensick at center. In other news, Wisconsin got good news this week when linebacker Chris Borland was cleared to play after hurting a hamstring against Indiana on Nov. 10, forcing him to miss the last two games. His presence will be key in trying to slow down a strong Nebraska rushing attack. The Badgers also will have wideout Jared Abbrederis, who has dealt with a concussion. Wisconsin has not lost a game in the state of Indiana since 2002. Under head coach Bret Bielema, the Badgers are 8-0 in the Indiana, with an average margin of victory of 23.8 points. The Badgers have struggled in close games, with their five losses coming by a combined 19 points. And Wisconsin’s last three losses have come in overtime. The last team to drop three overtime games in a season? The 2007 SMU Mustangs. Iowa State went 0-3 in OT games in 2005. Wisconsin last played three overtime games in a season in 2000, going 1-2. Since the first meeting with Nebraska, Montee Ball is averaging 153.6 rushing yards per game. Since Oct. 1. that is second-best among running backs in the country. In two career games against Nebraska, Montee Ball has run for 244 yards and seven touchdowns. A Wisconsin win in this game and a UCLA victory in the Pac-12 title game would set up a rematch of a Sept. 8 game at the Rose Bowl between the teams. The Bruins won, 36-30, notching 653 yards. It was the second most yards Nebraska ever had allowed in a game in school annals. These teams met earlier in the Big Ten opener for each back on Sept. 29 in Lincoln. On that night, the Cornhuskers rallied from a 17-point deficit to pull out a 30-27 victory. Nebraska hasn’t won a conference title since claiming the Big 12 championship in 1999. A victory on Saturday night would be the school’s fifth title in a different league. Nebraska also has captured titles in the Big 12, Missouri Valley, Big 6 and Big 8. In all, the Huskers have won 43 league championships. Nebraska leads the series with Wisconsin, 4-3. Bo Pelini and Bret Bielema played against each other while in college. 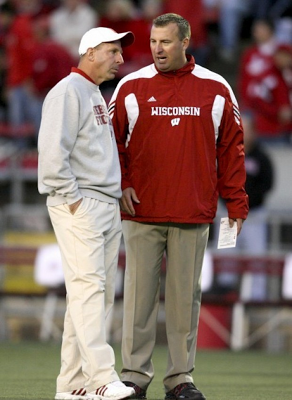 Pelini was a defensive back for Ohio State (1987-90), while Bielema was a defensive lineman for Iowa (1989-92). Also, Pelini and Bielema share the same agent in powerful Cleveland, Ohio-based Neil Cornrich. The Huskers’ seven conference wins are their most since 2001, when they also won seven and played for the BCS title in the Rose Bowl, losing to Miami (Fla.). Nebraska has won six games in a row, its longest overall winning streak since a six-game streak spanning the 2009 and 2010 seasons and longest conference winning streak since winning its final five regular-season Big 12 games in 2009 and the Big 12 opener in 2010. The Badgers seek to become the first Big Ten school to play in three consecutive Rose Bowl games since Michigan appeared in Pasadena from 1977-79.